How Thermal Imaging Technology, Latest Tools and a trained Home Inspection Team helped in assessing and finding source & solution to serious non-identifiable damp / seepage problem in a reputed Club of Bengal. The building was dripping in moisture problems. It had past leakage problems. Though some repairs were carried out still the issues were not properly rectified. It was both waste of time and money and most importantly having adverse effects on human health and shelf life of the structure. Why Team MACJ – A Buyers Choice Home Inspections was summoned? Moisture patches at back wall surface at different levels in the Reception Area. Moisture patches at front wall right side near external facade plumbing duct position along electrical conduit and discoloration at wall surface. Presence of moisture at parapet wall on right side of plumbing duct above curved chajja projection. As confirmed by IR images, water intruding from rain water outlet concealed along the parapet wall. 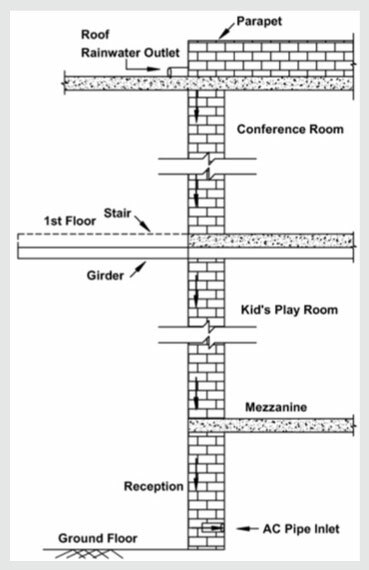 Gaps and deteriorated plaster of parapet wall lower portion at skirting level, around plumbing duct and around plumbing pipes clamped or concealed at parapet walls / skirting junction. Minor cracks with weathering effects noted at parapet wall flashing, external surface and at plumbing duct projected wall surface with parapet wall junction. 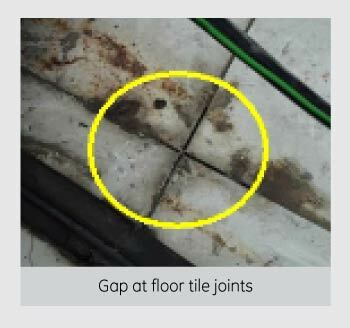 Gaps at tiled flooring noted at places effecting parapet wall lower portion. Inadequate grouting / bore packing and no grating at rain water outlets. IR images showed presence of moisture at external wall above reception area entrance door and around DB panel. The wall surfaces are affected by moisture infiltrating from #1- Roof- Parapet wall, #2- External facade – Plumbing duct, #3- Cracks at wall surface. Inadequate finishing and slope at curved chajja below roof level, which was leading to moisture intrusion along wall surface junction. Leakage noted at water supply pipe mid junction in plumbing duct, causing infiltration of water along the deteriorated wall surface. Plaster condition at plumbing duct wall surface at places with algae formation and bare brick works, open sleeve for plumbing pipes and other conduit insertions also been noted. Moisture intruding from roof level till ground floor level along duct positions damaging either side of wall surface. Electrical pipes not dressed at plumbing duct with bare plaster packing, causing moisture infiltration at either side of wall surface mentioned in Kids Playroom – Wall section. As noted AC drainage pipe terminated at duct wall surface right above electrical conduit insertions on right corner of duct and plant growth noted, from where moisture intrusion taking place during AC operation and rainy season. Roof – Rain water outlet & Parapet wall condition. Conditions of external plumbing duct. Step 1: Roof – Parapet wall, Plumbing and Flooring to be taken care. Step 2: Plumbing duct rectification. Step 3: Internal wall and External wall rectification. Main Essence – The main essence of any moisture problem is tracking the source. You not only need any engineer but an engineer who is a Home Inspector and has expertise in this particular field. Also the use of advanced tools & technology play a pivotal role in these types of inspection. In this case we got to know that intrusion of external moisture was mainly from plumbing duct and above roof rain water outlet with cracks at external wall surface. Also property maintenance is very important. If periodical maintenance or health check-up of any property is not carried out or problems are overlooked, then deterioration will occur and the issues will spread. It will adversely affect both the human health and property life. Taking care of the elements of any property will not only ensure smooth functioning but will also provide those elements a longer and healthy life.